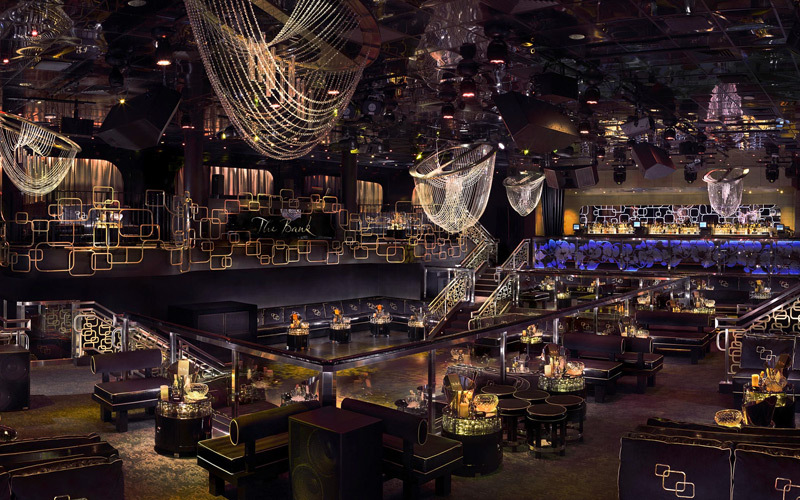 Hyde Nightclub Las Vegas is a dance club in Vegas at the Bellagio that opened New Year’s Eve on December 31st 2011. This 10,000 square foot venue has a 714 person capacity, with 40 VIP table locations throughout 3 sections on 1 floor that include The Living Room, The Study, Grand Salon, and Outdoor Fountain Terrace. Formerly known as the Fontana Bar, this Italian Villas inspired venue was the first Las Vegas nightlife project operated by the SBE Entertainment of Los Angeles, who worked in partnership with Philippe Starck Designs in conjunction with Marnell Architecture, and MGM Resorts International. This indoor outdoor nightlife experience features incredible views of the Fountains of the Bellagio through floor-to-ceiling windows or by accessing the Fountain Terrace through oversized glass doors. This nightlife hotspot creates the perfect mix of a lounge and a nightclub in one. Hyde Nightclub Las Vegas is an Italian lounge dance club in Vegas that is decorated with Italian marbles, dark brown woods, contemporary chandeliers, stylish chairs, rich fabrics, and white drapes. Interior design elements include tiled flooring, hanging mannequins, dimly lit lamps, vases, paintings, vintage mirrors, and a wraparound book shelf. The design layout was well crafted in that every table location make guests feels like they are sitting in prime real estate in the club. This club is the perfect spot to feature wedding receptions, family events, corporate events, and just about any type of high end formal gathering for groups. When is Hyde Nightclub Las Vegas open? Operational hours at this dance club in Vegas are 7 days a week. Hours on Sunday, Monday, Wednesday, and Thursday are 5:00PM to 1:00AM. Hours on Tuesday, Friday, and Saturday are 5:00PM to 4:00AM. Where is Hyde Nightclub Las Vegas located? The location of this dance club in Vegas is on the northern end of the Bellagio Hotel and Casino on the eastern wall. If you are facing the hotel directly, the club is on the right hand side of the fountain lake on the North corner of the Bellagio. If you are at the main casino cashier, it’s to your left in the middle of Jasmine and Le Cirque, just past Yellow Tail and LAGO. How much is cover charge at Hyde Nightclub Las Vegas? Cover charge at this dance club in Vegas is $30 for guys and $20 for girls starting after 10PM. The price of the cover charge may increase during holidays like New Years, and Memorial Day Weekend , as well as for special events like XIV Parties. What is the dress code at Hyde Nightclub Las Vegas? 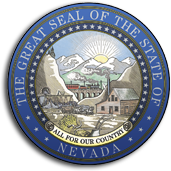 Dress code at this dance club in Vegas is strict that encourages dress pants, nice jeans, sports coats, collared shirts, dress shoes, belts, and pretty much any type of upscale casual clothing. You are partying in the Bellagio Hotel which is upscale, so you should avoid sportswear like jerseys, basketball shoes, hats, sandals, shorts, Hip Hop clothing, ripped or excessively baggy clothing. If you are unsure about the clothes you are wearing, you should reconsider changing until you have no doubts that the door men will not give you any trouble. How long do I have to wait in line at Hyde Nightclub Las Vegas? Line waiting times at this dance club in Vegas takes about 15 minutes to 1 hour depending on the evening or event. Obviously the bottle service line will expedite the waiting time over the general admission and guestlist line. What type of music do they play at Hyde Nightclub Las Vegas? Music genres at this dance club in Vegas include Hip Hop music, R&B, and top 40 beats, along with celebrity guest appearances, and live performances. Who are the resident DJs at Hyde Nightclubs Las Vegas? Resident DJs at this dance club in Vegas in the summer of 2016 include DJ CLA, DJ Crooked, DJ D-Miles, DJ Five, DJ D-Sharp, DJ Ikon, Konflikt, and Joe Maz. 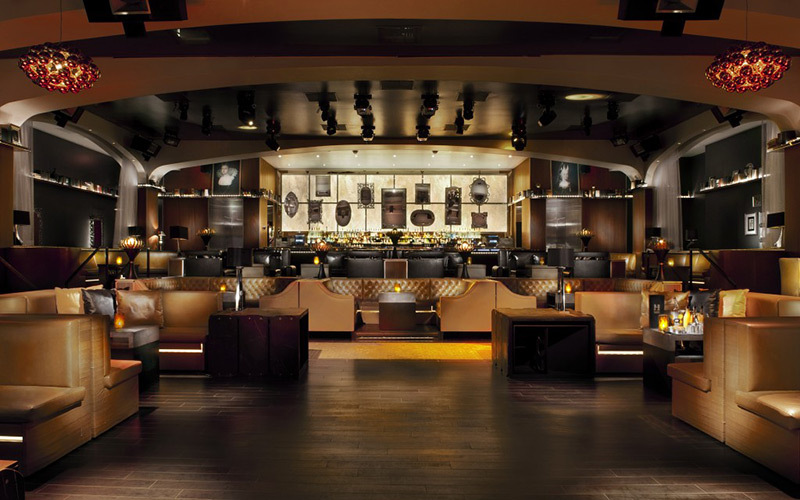 What is the Mixology Program at Hyde Nightclub Las Vegas? The mixology program at this dance club in Vegas is an award winning program that happens daily starting at 5:00PM where samples of small plates of food delivered from the Bellagio Italian restaurant “LAGO” by Julian Serrano. The program is like an upscale social happy hour that mixed with a lounge vibe. You can sit on Fountain Terrace then order items from the menu such as Edible Cocktail Sphere, Maestro Vegetariano, A Caramel Nest with Golden Raspberries, Pastas con Panache, Piatti Grandi, Pineapple Cone with Mini Fruit Pearls, Caper Berry Stuffed Chorizo, and an Italian Chocolate Cookie. On Wednesday during the mixology program select bottles of wine are half off from 5:00PM to 10:00PM. There are over 1500 types of wine you can order, and the selections rotate every month. If you arrive early enough you can carry over your attendance to the nightclub hours free of charge. 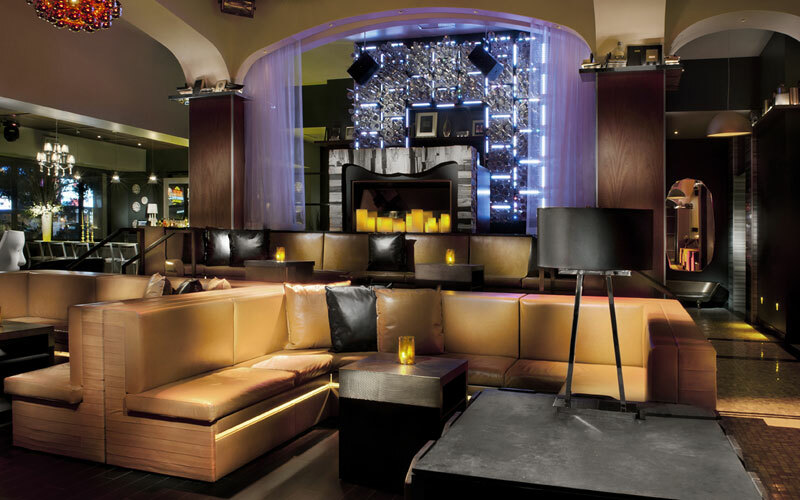 What is the Living Room in Hyde Nightclub Las Vegas? The living room in this dance club in Vegas is in the 1st section of the main room of the club which is hidden behind the right wall of the hallway main entrance. The Living Room has 18 VIP table locations that feature brown leather sofas, black short and long booth couches and U shape seating. The Living Room also has its own fully stocked bar. What is the Grand Salon in Hyde Nightclub Las Vegas? The Grand Salon in this dance club in Vegas is in the 2nd section of the club section. 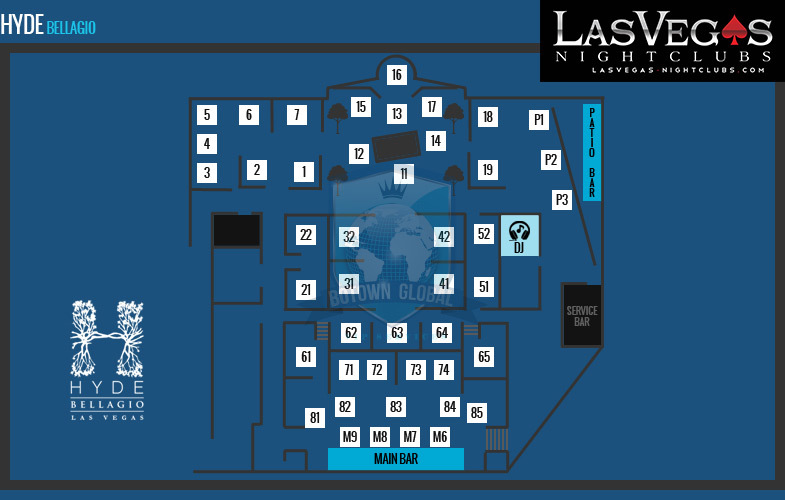 This centrally located area of the club has 8 VIP table locations that surround small dance floor space in the middle. This elevated DJ booth is located on the south side of the Grand Salon section which can be seen by almost every table in the club, and offers a nice 360 degree view of the entire room. 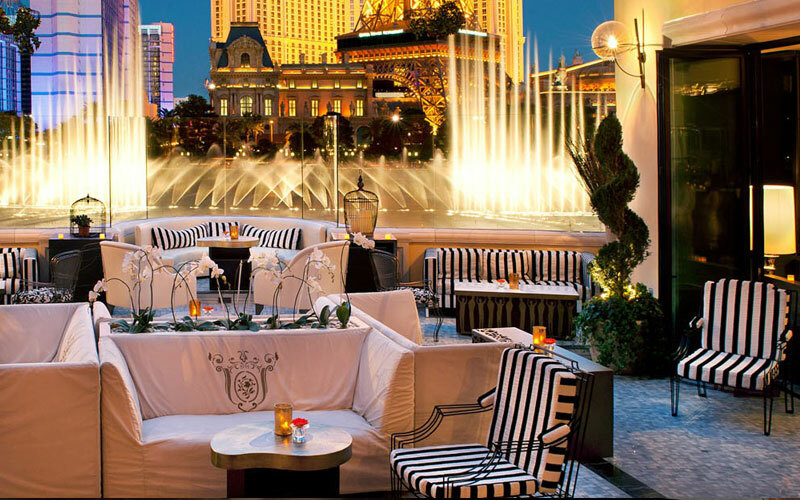 What is the Outdoor Fountain Terrace at Hyde Nightclub Las Vegas? The outdoor fountain terrace in this dance club in Vegas is 1,500 square feet located on the patio on the south side of the venue directly facing the Bellagio Fountains where you can catch a show every 30 minutes from Monday through Friday from 3:00PM to 8:00PM, then every 15 minutes from 8:00PM to 12:00AM. On Saturdays you can catch a show every 30 minutes from 12:00PM to 8:00PM, then every 15 minutes from 8:00PM to 12:00AM. The Outdoor Fountain Terrace features mosaic flooring, white, gold, and black finishing’s, along with white banquettes. What is the Study in Hyde Nightclub Las Vegas? The study in this dance club in Vegas is a high-end gift shop that sells Hyde memorabilia, clothing, furniture accessories, decorations, candle holders, and jewelry. The Study is located on the North end of the Grand Salon on the opposite end of the room from DJ booth. The Study is just to the left after you walk down the entrance hallway into the club. Where are the Bars in Hyde Nightclub Las Vegas? 3 bars in this dance club in Vegas exist with full service. The first bar is located in the living room which is also referred to as the Main Bar which is about 40 feet long and features 11 vintage mirrors reflecting views of the club. The second bar is the Terrace Bar which is found on the outside Fountain Terrace patio. This dance bar features a 1-way mirror, 7 bar stools, a hanging chandelier, and reflects views of the 1,500 square foot Outdoor Fountain Terrace. What is XIV at Hyde Nightclub Las Vegas? XIV at this dance club in Vegas is a sessions party thrown once a month on Sunday in the spring, summer, and winter. XIV was inspired by SBE’s XIV on Sunset Boulevard in Los Angeles, California which is currently one of the most popular events in Las Vegas. XIV parties are about to generate as much as $300,000 per night. Known for their champagne showers, confetti, and beautiful people, XIV Las Vegas delivers top notch house music, and has featured DJs in the past such as Afrojack, and Fedde Le Grand. Where is the DJ booth in Hyde Nightclub Las Vegas? The DJ booths in this dance club in Vegas are located in the Grand Salon section in south end of the main room. This elevated DJ booth holds a birds eye view of the entire club from every angle. The backdrop of the DJ booth has a few hundred horn bells sticking out of the wall, which creates a unique accent that fits the DJ booth quite well. The DJ is equipped with Pioneer CDJ 2000’s, Technic 1200 turntables, and a Pioneer mixer. What type of lighting does Hyde Nightclub Las Vegas have? Lighting in this dance club in Vegas was designed and developed by Steve Lieberman of SJ Lighting out of Los Angeles, California. Steve incorporated dimmed architectural lighting with theatrical-style lighting in all section of the venue. What type of presentation equipment does Hyde Nightclub Las Vegas? This dance club in Vegas has presentation equipment that includes built in audio and visual, built in projection screens, LCD projectors, overhead projector, Internet, WiFi, conference phone lines, tables, chairs, presentation stage, and video conferencing capabilities.